It’s been a while since I wrote my last post. 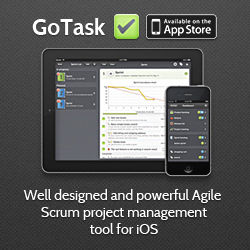 All my time and energy went into developing app with my friend Lukasz, but recently we released our first app GoTask for managing Agile Scrum projects on iPhone and iPad. It’s now available on the App Store. You can check our youtube videos about Scrum and GTD features. If you want to learn more about GoTask go to go-tap.com. So, I hope to spend more time writing articles on my blog! Actually I have already prepared a project on a github for my next article about creating small component which shows label in a shape of small popover. See you, soon!